When you were a girl didn’t you love to look at your mother and grandmother’s wedding gown? The beautiful satin and laces were irresistible. And when she wasn’t looking, wasn’t it wonderful to try it on? You may have decided right then to wear her dress for your wedding day. Vintage wedding gowns are unique and can even be the center of a vintage inspired wedding theme. Whether it is your mother’s, your grandmother’s, or just a friend’s bridal gown, you decided that your Something Borrowed would be a vintage wedding gown. Is it too small? You won’t be alone if you discovered that by the time you turned fourteen your mother’s dress was too small! Perhaps it is the vitamins in our diet or the junk food, but whatever the reason, people were just a bit smaller a few decades ago. But don’t despair if your mother’s gown is just a bit snug. 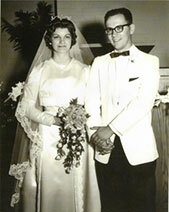 A vintage style wedding dress can easily be altered by a competent seamstress. Letting out seams and darts– Many of the older vintage gowns are cut with pinking shears and the seams are not finished. This makes it fairly easy to let out the seams a bit. Removing some darts or make them smaller. Side pieces added in bodice and sleeves – Wide skirts or long trains can be trimmed to add a side piece to the bodice and the sleeves. 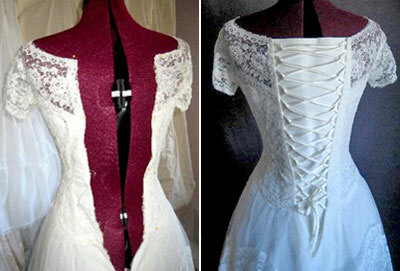 A corset back – Remove the zipper, and make a corset back with ties. Utilize the skirt or train to obtain the fabric necessary for this alteration, or find a matching fabric after your vintage wedding dress has been restored. Get your free online Restoration Quote for a Vintage Wedding Gown or Call 866-268-4696 to talk to one of our friendly staff members. 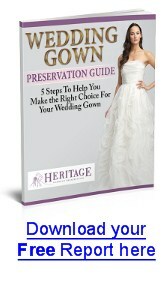 If your heirloom gown was stored in an acid free environment, it may be in excellent condition. However, many gowns are not stored in an ideal location and your mother’s gown may have yellowed significantly and/or acquired discoloration spots. Many brides prefer the ivory patina of an heirloom gown. But if your gown has too much discoloration, you may choose to have it cleaned and restored. 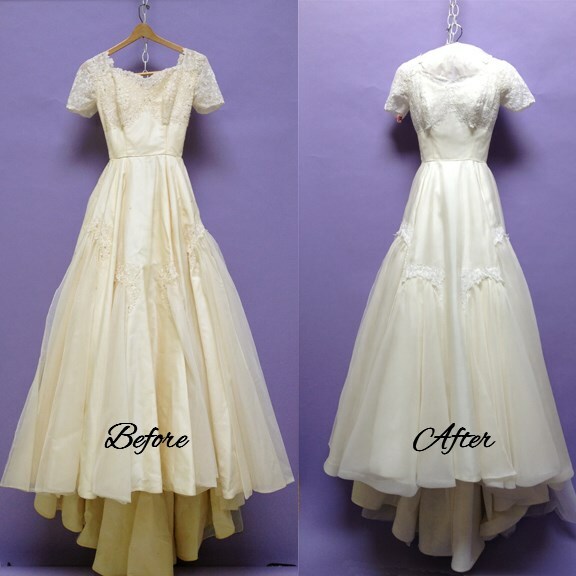 For best results, send it to a company that restores wedding gowns.Heritage Garment Preservation offers professional restoration services for heirloom wedding gowns. If you choose to clean your vintage wedding gown yourself, be aware of some of the challenges this entails. Wedding gown restoration entails cleaning with water. Many vintage gowns are made from rayon, acetate and silk. These fabrics can be challenging to clean with water and difficult to press afterward. For a truly unique wedding, consider styling your whole wedding after the era of your gown. 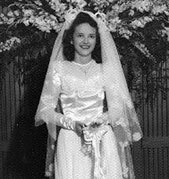 You can learn more about weddings in days gone by from the monthly newsletter prepared by Cherished Online Vintage Bridal. This online bridal store offers vintage weddings gowns and accessories. You just may find the perfect jewelry and veil to match your grandmother’s dress from their authentic collection. Before you plan a whole period wedding, be sure your dress will be able to be restored and made to fit you properly. Get your free online Vintage Wedding Gown Restoration Quote or call 866-268-4696 to talk to one of our friendly staff members.